Green, leafy veggies are a MUST in everyone’s diet. The problem is, most are bland and do very little in the way of enticing people to eat them. Most green vegetables get a bad wrap as a bland, good for you only, tasteless food. I am here to tell you that Collard greens are an excellent source of so many things that are good for you. Fiber, Antioxidants like Vitamins A and C. They are also rich in Vitamin K as well as B vitamins and calcium. You can do your body a great service by including more leafy greens like Collards in your diet. But how do you make Collards taste good? That is one of the most common questions about almost any leafy green vegetable. Lucky for you, I am about to tell you how to! Wash your collards at least 2 times to make sure you get all of the sand off. I typically wash mine once still on the stem. Rinse them and tear them off the stem and soak the torn pieces again and rinse and drain. In a 6qt or larger Instant Pot, place your onions, garlic, ham hock, red pepper flakes, salt, pepper and broth. Place the torn and washed collard greens on top. I usually have to pack mine in pretty good. It’s important to note here that I can usually only get 1 bunch of collards in my 6 qt IP. If you have a larger Ultra or 8 qt, you may need more. Seal the lid, close the vent and set the Instant Pot to manual or pressure cook for 30 minutes. When the cook time is up, allow to NPR (natural pressure release) for about 10 minutes. Carefully open the vent to release any remaining pressure and remove the lid. Remove the ham hock and discard. Add in the apple cider vinegar and stir well. 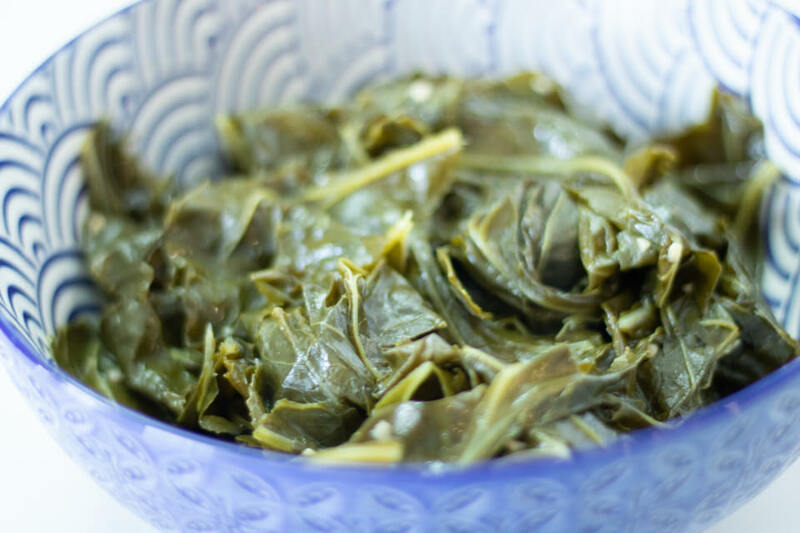 Collard Greens in the Instant Pot, So Easy and So Good! So there it is. The secret to making something so good for you even taste better! Now feel free to cook them on the stove the same way, just be prepared to cook them for a longer amount of time. The addition of the ACV is the same. It cuts the bitterness of the greens and help smooth the balance between the bitter and the smokiness of the ham hock. As always, we would love it if you shared this recipe with your family and friends. Over to the side on this posts and all of the others are handy dandy share buttons. We would sure be grateful if you shared the love!